I travelled to he burbs yesterday after a break and saw two new shops had opened on the Bandra - Juhu stretch, accompanied by dozens of placards marking the surrounding territory. Diesel at Juhu has gone the whole hog with its 'Stupid' campaign. The store itself has large letters stencilled on its glass front screaming 'In Stupid We Trust'. I don't blame them, only somebody stupid would buy that stuff at those prices. Täshi is a new shoe store run by a wing of the Tata group. Täshi supposedly means 'auspicious' in Tibetan; or at least 'Tashi' means auspicious. Little did Reuben and Rose Mattus know, when they founded Häagen-Dazs in the Bronx, that they'd kick of a long and disturbing trend in faux-European umlauting. I'm not going to explore Täshi anytime soon. My experience with DTH has put me off the Tata brand. Besides, their Nanos aren't doing too well either. 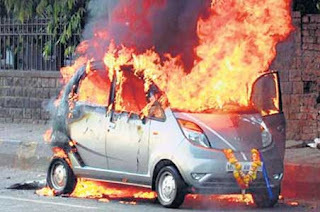 Tata Motors has offered a free upgrade (which they insist is not a recall) because the cars have a bad habit of catching fire. This might be Ratan Tata's shot at automotive history. Karl Benz developed the internal combustion engine for motor cars. Tata has, apparently, developed a spontaneous combustion engine. If Tatas had stuck to Parsi tradition of deriving surnames from their trades, they'd have been called Afeemwalas, the trade in which they first made ther fortune. The 100+ years of fooling the retail shareholder, the maze of crossholding patterns in the group companies, and the fact that it took 10+ years to clean up TCS books before the IPO and yes, the good M and bad M comment the bad M being Mamata who was voicing legitimite concerns(however politically motivated)- why do tatas still have this reputation of a corporate with strong ethics? Whatever I know about the group indicates they do maintain high ethical standards in how they conduct business and they treat employees well and with respect, which is not what Reliance does, for example, that much I can say from experience. As far as Singur is concerned, the central issue is that companies have no way to acquire land without using the government as intermediary, which creates a host of problems.